Improves water clarity through remineralization of latent dissolved organic compounds present in system. Katalyst should be housed in a media reactor, canister filter, or fluidized-bed reactor with a means of controlling water flow through the media bed, and with a pre-filter in place to restrict particulate material from entering the reaction vessel. Moderate water flow will discourage the accumulation of latent organic material in the media bed, itself, and will improve overall results. 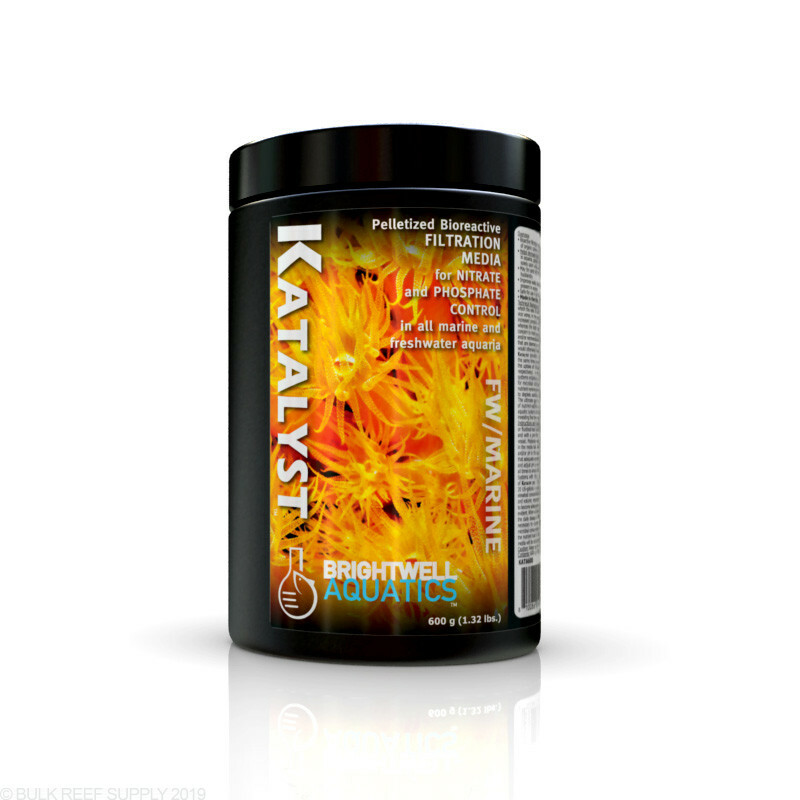 Dissolved oxygen concentration and/or pH in the aquarium may temporarily decrease when new media is added; ensure that adequate aeration of water is employed at all times when using Katalyst, and monitor and adjust pH as necessary. In marine aquaria, maintain operation of protein skimmer at all times to ensure that adequate degassing and oxygenation of water is taking place. Systems with [NO3-] and/or [PO43-] <5 ppm and 0.02 ppm, respectively: employ ~1 g of Katalyst per 2 US-gallons of water in aquarium system. Add 1 ml MicrōBacter7 per 20 US-gallons in system daily for first 4 weeks to seed Katalyst media. In systems with elevated concentrations of these nutrients, employ up to twice the afore-mentioned mass and volume, respectively, of Katalyst and MicrōBacter7. Allow at least 4 weeks for media to become adequately colonized for significant changes in nutrient concentrations to become evident. When nutrient concentrations drop below the target values (user-defined), decrease the daily dosage of MicrōBacter7 to maintain these levels. Replenish Katalyst media as necessary to counter gradual dissolution (on the order of months) that is the result of microbial consumption of the material. The rate of media deterioration is largely related to the nutrient load in the system: the higher the rate of nutrient input, the more quickly the media will be consumed by microbes. In all aquaria, it is prudent to establish a stable nutrient budget in which the rate of nutrient export is not greatly exceeded by the rate of nutrient input, and vice versa; in the proper physical and chemical conditions, the former imbalance leads to increased presence of nuisance organisms such as filamentous algae and cyanobacteria, whereas the latter leads to malnourished aquarium inhabitants. The nutrients of greatest concern to most aquarists are nitrate and phosphate, both of which require active removal and/or remineralization in aquatic habitats to ensure that they do not exceed concentrations that are deemed as safe for the ornamental organisms inhabiting those systems, or that would otherwise impact the appearance of the system, itself. Katalyst provides a static surface for colonization by beneficial microbes, while at the same time providing them with a source of organic carbon, which is required for the uptake of nitrogen and phosphorus compounds (including nitrate and phosphate, respectively). 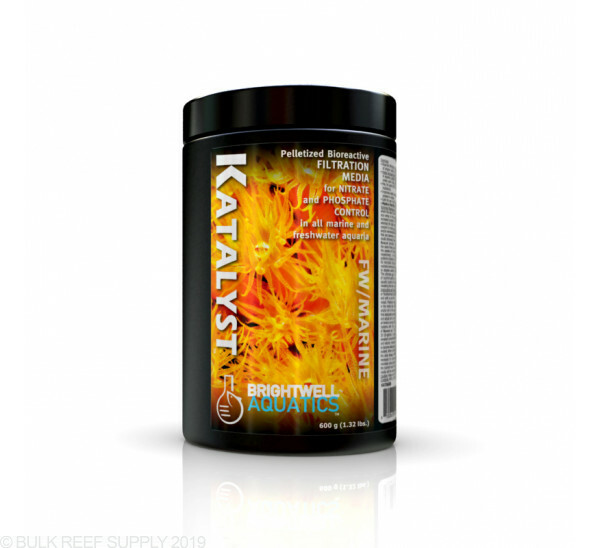 In this fashion, Katalyst improves nutrient-uptake efficiency relative to systems employing only live rock, live sand, and/or inert plastic material as a substrate for microbial colonization. The colonization of Katalyst with the appropriate types of nutrient-remineralizing microorganisms, such as those found in MicrōBacter7, serves to deplete existing concentrations of dissolved organic material from the aquarium. The ultimate goal in employing this system is to maintain a balance between the rate of nutrient-addition and -removal/uptake; this balance is different for each individual aquatic system and takes time to "dial-in" and obtain the desired results. The reward for investing the time required to attain this balance is improved water quality.